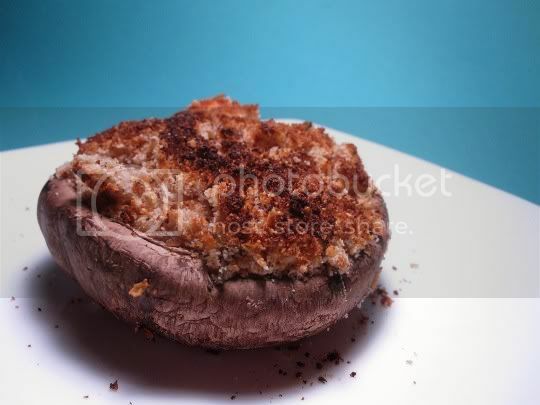 As soon as I saw the "stuffing" mixture amount that was to fill four large portobello caps, I knew making these was going to be an interesting architectural feat. A LOT of breadcrumbs and a LOT of grated Parmesan cheese are mixed with minced garlic and fresh rosemary: a little water is added, I guess to condense the mixture for stuffing, but it really doesn't do much of anything. I wonder if adding more water, or using fresh vs. dry breadcrumbs, would make a difference. The recipe wasn't very clear about which to use; I used dry. And dry these were. You'll basically be eating a mouthful of breadcrumbs...good yummy flavored breadcrumbs, but a mouthful of breadcrumbs nonetheless. Each mushroom is salty, garlicky, and full of woodsy rosemary flavor, and the earthy and meaty portobello serves as a solid foundation for the messiness. I'd suggest maybe adding more water to the mixture, or almost halving the amount. These could even make good bite-sized appetizers using smaller mushrooms. Make again? Maybe, with a bunch of recipe variations. But...I've had better stuffed mushrooms than this. Vegan variation: Use soy Parmesan.